Oil-Electric: "A little privacy, please?" Northern Pacific, Auburn, Washington, March, 1965. A lady should be spared such public humiliation. Notice one truck has already been scavanged. One of only two Baldwin 15-hundred horsepower road switchers owned by Northern Pacific. Originally built as the 175 and 176, the 500 and 501 were used in both freight and passenger service. They had an eight cylinder Model 608SC motor. It is my understanding there were only about 30 of these units ever built, so I was fortunate to see the 500, going through trying times. Railroad Stuff: Baldwin Locomotive Works, Model DRS 4-4-15, built: 8/48, SN: 73645, Retired July 1, 1969. Please note that this is an EMD engine, not the original Baldwin. 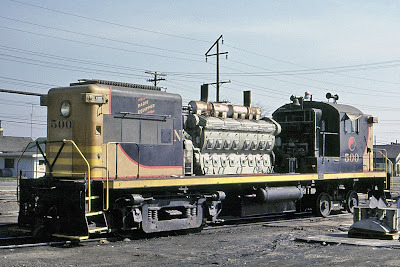 The NP re-engined both Baldwins over the years, as they did with a few of their Baldwin switchers.